Even before Gillette announced its over-the-top Mach 5 blade, I made the switch from my Gillette Mach 3 shaving razor (using a standard from-a-can shaving cream) to this “classic” safety razor (with a badger hair brush and good shaving soap) and am amazed at the difference. I switched after years of razor burn and irritation, and after reading an article and visiting a website devoted to classic shaving. 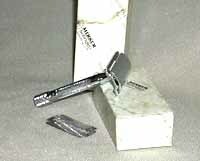 This Merkur razor hefts nicely in your hand, and delivers an amazingly close shave without irritation. I believe the safety razor causes less irritation than the Mach 3, because of the quality of the safety razor blade itself. I think that the marketing strategy of the Mach 3 is to dazzle the user with 3 blades, implying that three blades is three times as effective as one blade. Because the value (to the user) lies in the quantity of blades, the quality of each individual blade can be lowered. Furthermore the multiple blade design of the cartridge razors is actually ineffective–the spacing between the blades gets clogged with hair and shaving cream very quickly into the stroke, seriously comprising the efficiency of the higher blades. Another reason is that the cartridge razors are designed to encourage the user to press harder to get a closer shave (not the case with the safety razor). So now if you want a close shave, you are scraping a sub quality razor hard against your skin–resulting in irritation. YMMV. I’ve never enjoyed shaving so much. At about $37, the Merkur might seem a bit expensive compared to Gillette or Schick, but the real expense for a razor is its blades. Quality double-edge blades for this razor run around $0.45, compared to 3-blade cartridges, which cost at least $1.50.